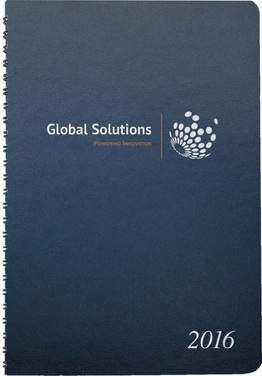 Flexible, wraparound covers with rounded corners; choose between Prestige (GlossMetallic, Linen, or ColorFleck) or Leatherette materials. 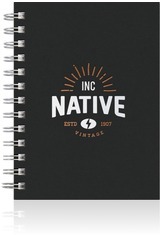 Includes a 1-color foil imprint on front cover, a 12-month planner in front (pages are tabbed for quick reference), and 50 sheets of ruled filler. 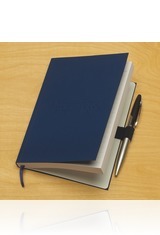 Black wire binding is standard (more color available). Call for higher quantities. Setup fee of $52.50 G. Price includes one foil imprint up to 16" sq., or full-color printing on outer wraparound cover for Full-Color style. Standard turnaround 10-15 business days from proof approval. Actual pre-production sample available for $112.50 G.